If you need paper badges we offer two sizes, both printed double sided as standard. 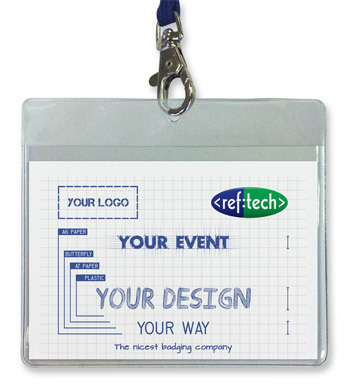 All badges can be printed quickly and easily, with event logos and colour coded if required. Agenda and event information as well as a barcode can also be added. A7 paper badges are sheets of pre folded A6 paper which when folded creates an A7 badge. Once printed, they just need to be slipped into a plastic badge holder for use. 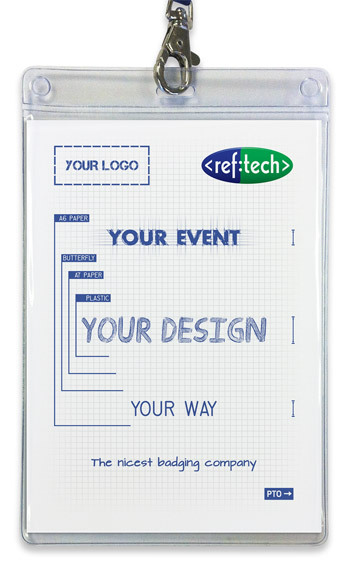 Badge dimensions when folded are 102 x 70 mm. A6 paper badges are sheets of pre folded A5 paper which when folded creates an A6 badge. Once printed, they just need to be slipped into a plastic badge holder for use. Badge dimensions when folded are 105 x 148 mm.